Gord Hayes (wearing the Vancouver Canucks' jacket) joined by Ron Paterson, Tyler Paterson and Doug Paterson following the Richmond Sockeyes' Cyclone Taylor Cup championship. One of the local sports community’s greatest champions passed away Sept. 11, leaving behind a legacy of generosity. Giving was forever at the forefront of Gordie Hayes’ mind, and he never missed an opportunity to lend a hand or brighten the lives of others. Perhaps his own journey in life was inspiration. The youngest of 11 children, the native of Montreal lost his dad when he was only three. His mom, who raised him and his siblings as a single parent, died when was 16, forcing Hayes to grow up quickly. Fortunately he took a shine to sports, with baseball and hockey both becoming lifelong passions. As a taxi driver for 18 years, he got to know several of sports celebrities. Former Vancouver Canucks’ goaltender George Gardner, who also grew up in Montreal, became a close friend. In 1963, Hayes decided to pack up everything and head west. After residing briefly in Vancouver, he settled in Richmond and, displaying a talent for cooking, ran the concession and sports shop at the old Gulf of Georgia arena on Francis Road. He also operated a general store on Sea Island for years, and later a cafe in Crescent Beach where he eventually moved during the 1970s to also operate a general market on Beecher Street. Reflecting his generous nature, Hayes’ 25 cent candy grab bags became legendary with local kids. He was also known to serve Christmas dinner in his store for those who had nowhere to go. Hayes was also a great storyteller, and maintained his great sense of humour “right up to the last days of his life,” said Doug Paterson, a close friend for more than 50 years. “He was telling hockey stories to the nurses and doctors, and talking about the championship rings that he had,” Paterson said of Hayes, whose health became to decline soon after his beloved Richmond Sockeyes won the provincial Cyclone Taylor Cup championship in April. “The last two months we spent a lot of time taking care of him at home, prior to him going to hospice,” added Paterson, who along with his younger brother Ron became Hayes’ extended family. Ironically, Doug Paterson lived on one of Garry Street while Hayes resided on the other end. They would also spend a lot of time together at the rink, preoccupied in another of their passions—hockey. “I spent a lot of time with my wife, Gail, and Gordie at the rink enjoying great stories over a few beers,” Paterson said. The Paterson’s friendship with Hayes became when Doug was still a teenage hockey player in 1969. A few years later, he would become the first-ever captain of the Sockeyes and begin a decades-long association with the junior hockey club—today as a part owner. Attending Sockeyes’ games was also a ritual that Hayes never tired of. He also became one of the team’s biggest supporters, sponsoring the team and the alumni for the last 17 years. 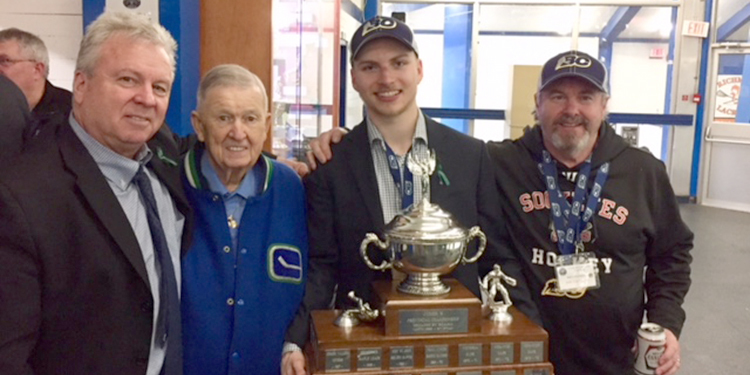 A trophy named after himself and late wife Shirley (whom he met in 1985) is presented annually to the winning team at the annual Sockeyes Alumni Game, an event that raises funds to support the club’s scholarship program. Hayes’ final outing with the Sockeyes was also one of his most cherished. Though frail, he attended the team’s championship ring presentation in Steveston at the end of August. He enjoyed seeing old friends again, and they him. A memorial service honouring Hayes’ life will be held Tuesday, Oct. 2 at 11 a.m. at Good Shepherd Church in South Surrey. Cards or flowers are not being accepted, but donations to Peace Arch Hospice Society in Hayes’ name would be appreciated.